If you take part in an aphasia support group, whether as a leader, participant, or caregiver, Lingraphica has a few ideas to help you get and keep the conversations going! Check out these 10 suggested activities. Several of our blog posts from the summer of 2017 centered around the topic of Supported Conversations for Adults with Aphasia (SCA)—the model of communication developed by the Aphasia Institute in Toronto. The idea behind SCA is that people who have aphasia know more than they can say, but they need a little help with understanding the messages from others as well as getting their own messages out to others. The goals of SCA strategies are twofold: 1) to acknowledge the competence of the person with aphasia, and 2) to help him/her reveal and realize that competency. Both of these goals help to build the confidence of the person with aphasia and recognize that his/her life is bigger than aphasia. Achieving these two goals can take some time and effort for everyone involved. Taking part in a support group can certainly help those with aphasia as well as their caregivers/communication partners. Being in a room with other people who go through similar experiences is not only comforting, but also makes participants more likely to engage. 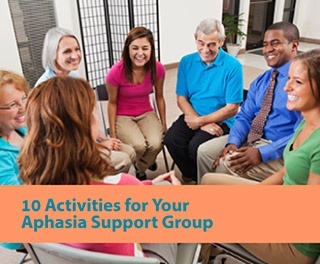 To further this engagement, Lingraphica has created a tip sheet for aphasia support groups which centers around activities to bring about supported communication. These ideas are designed to stimulate the participants in ways they perhaps are not used to. For example, writing a script and role playing an everyday activity, such as going to the grocery store or bank. Figuring out how a person with aphasia would go about accomplishing this task and what tools (whiteboard, speech-generating device, app, pencil and paper, etc.) he/she might need. For a downloadable list of all 10 activities that you can share with your support group (or support group leader), simply click the button below. Here’s to better supported communication!